An increasing number of solutions are emerging where Apex is being used to consume the Salesoforce REST or Web Service API's. These might be time saving applications that interact with the Metadata API or tools that help move data from one org to another by using the Salesforce REST API. Having to ask users to configure the approprite Remote Site entry for a Salesforce server inhibts the ability for users to get started with such tools and raises unneccessary questions, when the end points point straight back to the Salesforce servers. Please allow callouts to Salesforce API's from Apex to be permitted without a Remote Site setting. Another 1.1k points: https://success.salesforce.com/ideaView?id=08730000000KmowAAC . This one could be solved via the Metadata API or UI API, and this idea. IMO the existing apex metadata api doesn't deliver it because you don't know which page layouts belong to which object, you can only describe them if you happen to know a page layout name. This is needed for complex managed packages that need to access the API's to work around limitations in the platform which are numerous. For example if I want the SOQL of a List View to enhance the query with some additioanl filters programmatically I need to call the REST API to get the describe of the List View. I can't get SOQL statement in Apex natively I need to call REST API. Doing this in Lighting Component is impossible without a Remote Site Setting and Named Credential. As users are already authenticated and authorized to the platform requiring a named credential in Lighting Experience is not scalable for large organizations. 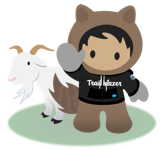 First off, thank you Andy for driving this discussion both here on the trailblazer community as well as internally. For others, Andy and I have both worked on ports of the metadata and tooling apis (SOAP and REST), so that they can be invoked over Apex, so naturally the remote site setting would help with those ports. Both ports, by default, use the current user's session id (along with a remote site setting) to pass the authentication along and call the API. However, I'll also caveat that passing the current session id only works for *some* users, primarily those with API access (I think anyway). That's a lot of pre-work to do, to perform something trivial like getting a list view query, for instance. Other use cases I can think of include generating a code coverage report in Apex, doing describe calls that aren't quite available through the Apex metadata "API", and other features within Apex that are lacking feature parity with the SOAP and REST APIs. 1) Close the feature parity gap between the SOAP, REST, and Apex versions of Metadata, Tooling, Reports and Dashboards, and other APIs. 2) Have a default connected app, auth provider, named credential that come out of the box in an org and allow developers (especially ISVs) to call an API within the SAME ORG without having to set up any of the aforementioned configurations. 3) Some other solution that nixes the need for any extra config, and just lets ISVs and developers develop. I am echoing Scott Wells. The Salesforce APIs are great, unfortunately to leverage them customers are forced through a confusing experience (aka, "You're telling me that I have to tell Salesforce... it can talk to a Salesforce API?"). This is amplified in the ISV context where we are technically hamstrung and the customer may not understand the reasons for this additional configuration. Regarding delivering this idea, I think the impact/points of this idea needs to be determined based on all the other ideas and roadmap it would deliver. • Make the UI API accessible to more users. The UI API is great for drawing UIs, unfortunately pesky users/orgs who are not API enabled also enjoy a UI. • From the outside looking in, I assume there would be some increase in product delivery velocity around a holistic approach to API access in Apex. No longer would product teams who choose to deliver something in the * API have to worry about delivering it in Apex at some later date. I encourage community members to add to this list. I also strongly encourage Salesforce product management to review their ideas and flag which ideas/roadmap would be delivered with this feature. Once all of this is summed up, I think it will be easy to quickly prioritize and deliver. I can't overstate the value of this. Having spent the past eight years working as an ISV across two companies, there have been more times than I can count that having access to the SOAP/REST APIs from Apex would have allowed us to solve otherwise difficult/untenable problems. While you can do this with a remote site setting, you can't package a single value for all subscribers, and asking all our of subscribers to provision a setting for their respective base URIs was considered a no-go for a number of reasons (not the least of which is that it just seems exceptionally clumsy, especially when your customer isn't Salesforce-savvy). I get that there's a potential security/trust issue here, but there has to be a workable solution. Speaking from the ISV perspective, perhaps it's a permssion/capability that must be accepted by the admin at package installation time just as a packaged remote site setting must be accepted. Apex's recent enhancement to manipulate some presentation tier metadata helps, but there have been numerous other motivating use cases. For example, right now our manage package includes a nightly automation uber-process that is comprised of a series of batch/queueable Apex processes that are orchestrated for serial execution. If/when something in that process fails, we would like to be able to query the Apex log for that specific job and attach it for diagnostic purposes. This is especially valuable in test/UAT enviornments where full logs are available, but even in a subscriber org where these logs are sparely-populated due to IP protection, it would still offer more insight into what failed and why than...well...nothing (right now we do capture any exception stack trace, so technically not "nothing"). And in order to do that we'd also need to ensure that a trace flag/log level is properly configured for the automation user when scheduled Apex starts our nightly automation process starts. Lots of possible applications for this - one issue we had a while back was a requirement to access and anonymise the cc: email addresses in workflow email addresses from and Apex class. Absolutley a must-have feature. Keep remote site up to date upon refresh can be annoying. Simply a must-have feature. We use several Salesforce APIs, and we make heavy use of Sandboxes, and we're also migrating to DX. Since each new org spun up will have a different URL, this means there is an automatically required extra step of manually updating the Remote Site Setting in each org we spin up, amongst all the other things we already have to do manually just to make an org functional enough for development, which takes a lot longer than it should. With the Dependency additions to the Tooling API, this would allow coding devs to create tools for declarative devs to better understand their orgs. And with the UI API, developers could build great interfaces for their users with slight variations based on the circumstances. Imagine if my code could easily create static resources as needed. That’s what I want most. No, Files won’t give me the same functionality. I could do it with the Meta Data API, but right now the overhead for that seems excessive for what I am trying to accomplish— use Apex in an org to create a file for use by Apex in that same org. Any security concerns should have been addressed when these features became available for code outside of my org, which presents a bigger risk IMHO. If you can't give us https://success.salesforce.com/ideaView?id=08730000000l4TkAAI this would be a nice starter to get warmed up.